Happy Halloween to everyone getting their spook on tonight! I'm ready to rock my witch hat and hand out some candy to all the costumed cuties after work. It will be fun to see what the hot get-ups are this year. I can remember that last year was all about the Avenger super heroes for the boys... I must have seen over a dozen Iron Men, LOL! Anywho... at least I can have fun altering them in the meantime. The papers are a bunch of scraps that I had on hand and a couple stickers and a whole lot of dies completed the design. I don't think I want to know what Witchy Creeper was doing with that bone but it sure looks cool, LOL! Alrighty, time for me to make like a banana and split. I know, I know... I promised Halloween and here I am with a Christmas card. Not only that but there is no coloring to be found either! What can I say? Some things came up, knocking me off my original game plan. But I didn't want to go another day without a card to share so I'm posting this simple Christmas one that I recently made. 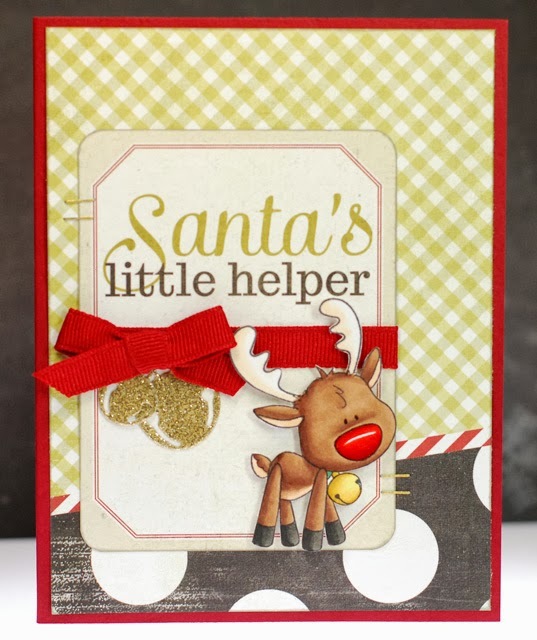 It's just me having fun with some dies and old non-Christmas themed papers. Pretty darn quick and easy if the truth be told but I really like how it all came together. 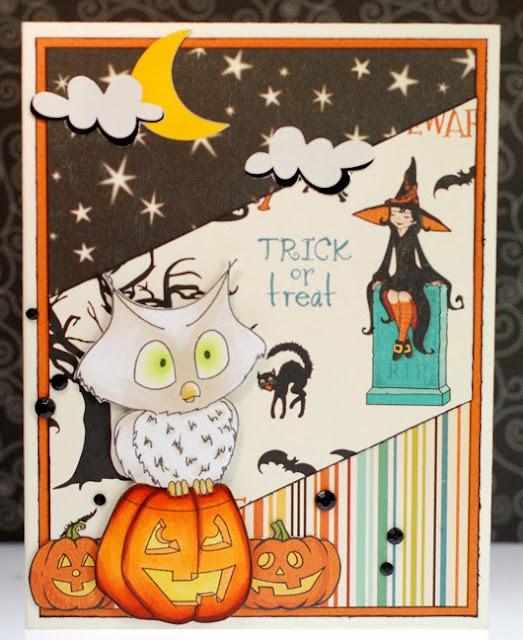 As for my card today, it looks like Luna the owl is having her own great October day out among the witches, bats, and black cats. The Witch Hazel paper from October Afternoon really created a fun scene for this little owl to live in. I cut it on a diagonal to work with the print better but I also like how it shook up the design a bit. A few gems and the Pebbles stickers that I've been using like crazy lately and this card was done. 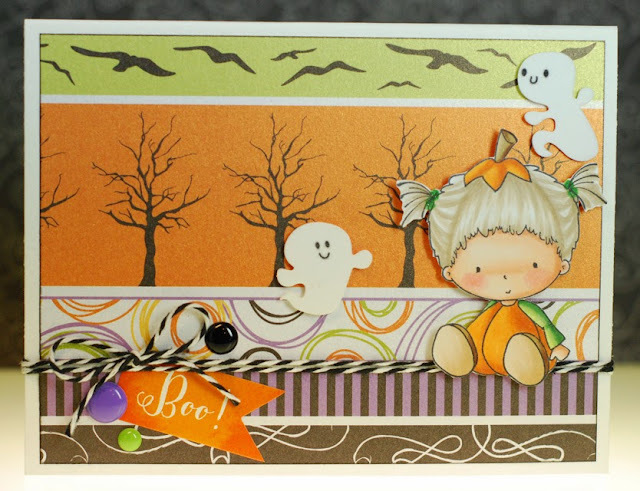 I'm just popping in with another Halloween card to share. It's hard to believe that the big day is less than a week away... where did this month go? I should go dig out my trusty witch hat since I'll be needing it for handing out candy to all the trick-or-treaters after work on Thursday. Hopefully we don't run out of candy early like last year, that was such a bummer. At least this little trick-or-treater is looking happy and ready to get her spook on. 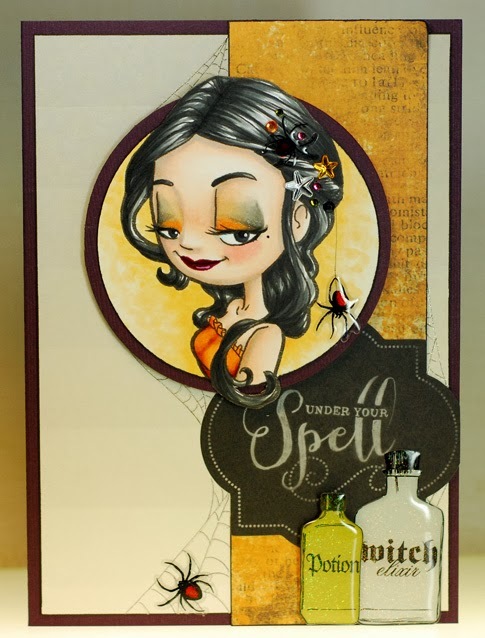 Punkin Beatrice is an oldie but a goodie and I just had to get her inky again. 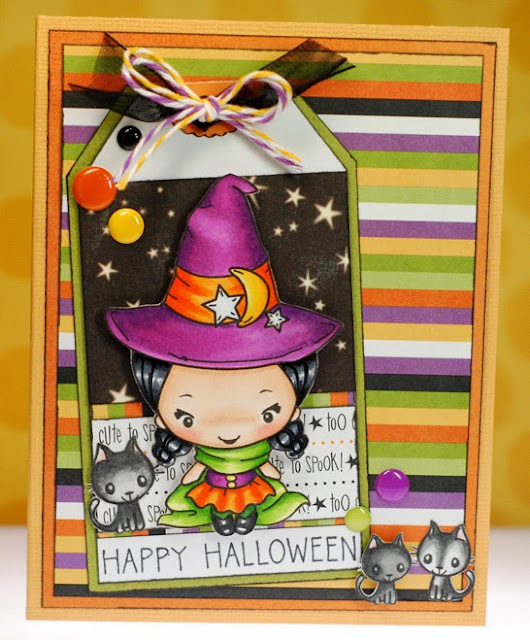 I paired her up with an even older favorite... KI Memories Halloween paper. Their style was so 'me' and I still miss the old KI, it can be hard cutting into and using the stash of it that I do have but I'm trying to get better about that. And while I'm longing for old favorites, I hope that we'll see new Beatrice stamps sometime in the future. 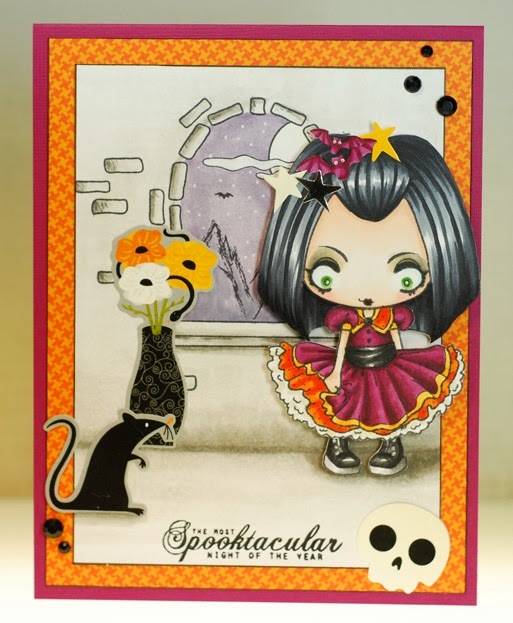 Along with the Laugh line of stamps, Beatrice is right up there in my top three fave characters from CC Designs and if you ask me it has been too long since a new one was released. I don't know if it is just all the years that I've been stamping and/or paper crafting but lately I feel like I'm not seeing a lot of my old favorites anymore. My wish lists aren't as long these days, and while that is great on the pocketbook, I miss having so many new stamps to choose from each month. Sigh... where did that bit of crafty melancholia come from? Sorry to be such a downer guys! I'll go get ready for the day and adjust my attitude into something a lot more positive, LOL! Alrighty, I've got to get myself ready for work. 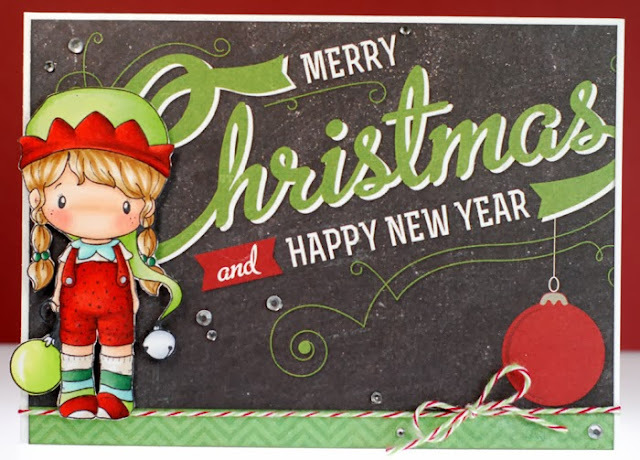 If you have a minute, you'll want to check out the CC Designs blog for more wonderful review preview cards from my teammates today... it's a whole lot of Christmas eye candy! 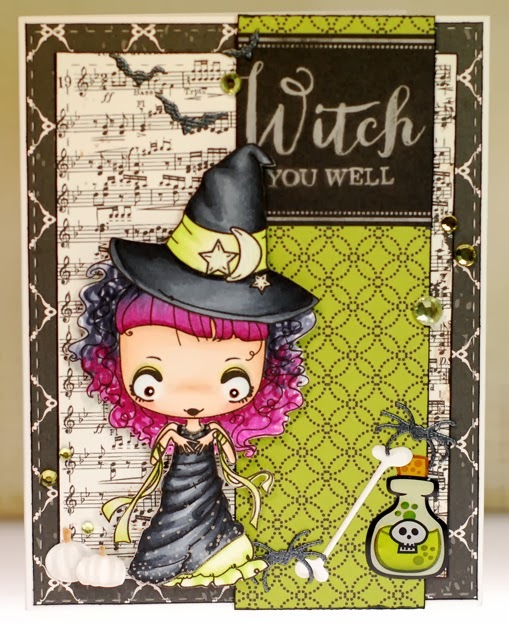 And all of the October release stamps can be found right here in the CCD store. Well, I wish I could stick around longer but I've got a list of things to do this morning before I head off to work. Alrighty then, thanks for stopping by and I hope your weekend is wonderfully creative! 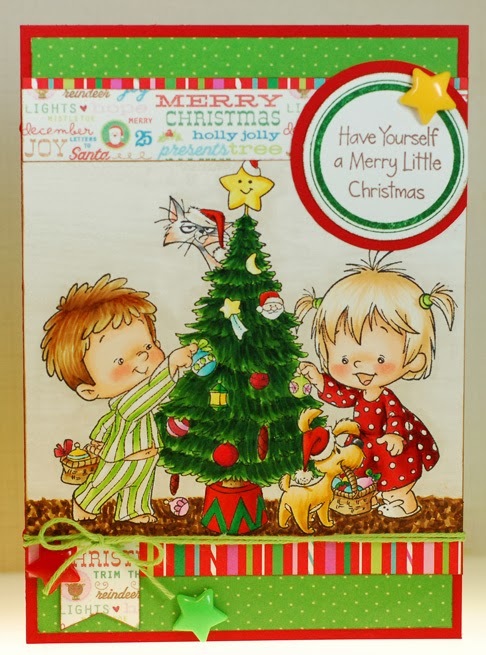 I've been coloring this Merry Christmas stamp off and on for a few days because there is quite a lot going on in this super cute scene. Henry and Twila are busy decorating the tree with a bit of 'help' from their four-legged friends and I think I must have been having flashbacks from my own childhood memories of Christmas because I gave these kiddos the same brown shag carpeting that I grew up with, LOL! I didn't even have any papers in mind as I worked on this image which is unusual for me. 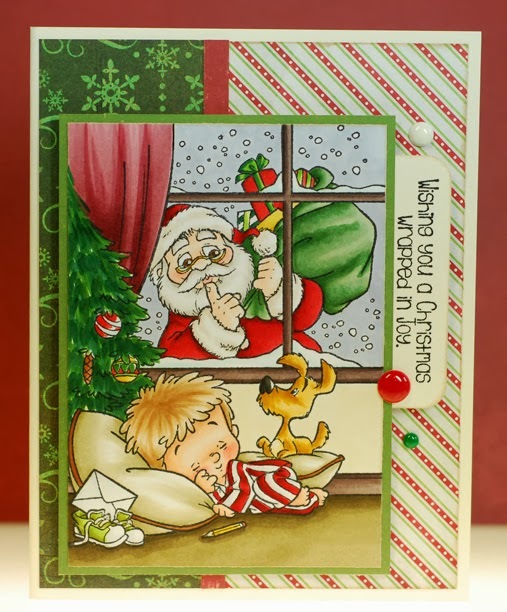 But I felt pretty safe, considering I have a lot of Christmas paper scraps to pull from and ended up with a fun mix of prints to highlight Henry and Twila's Christmas joy. Well, I'm back to work today. Hopefully I'll have something to share again tomorrow. Seriously, this card couldn't have been any quicker to put together. Which was a good thing because I was pretty busy yesterday. Hopefully with my day off today I can really have some fun in the crafty room. I'm proud to say that there is finally a clean desk waiting for me in there, LOL! I guess that means I should bid you adieu and see what kind of a mess I can make. Because most of my day was spent out and about I didn't have time to create anything for a post yesterday. And I spent most of my free time yesterday cleaning off my desk and putting away all those new goodies that I'm anxious to get on a card or two. But I didn't want to go a second day without a post on here so I'm throwing up a non-coloring Halloween card that I made recently. 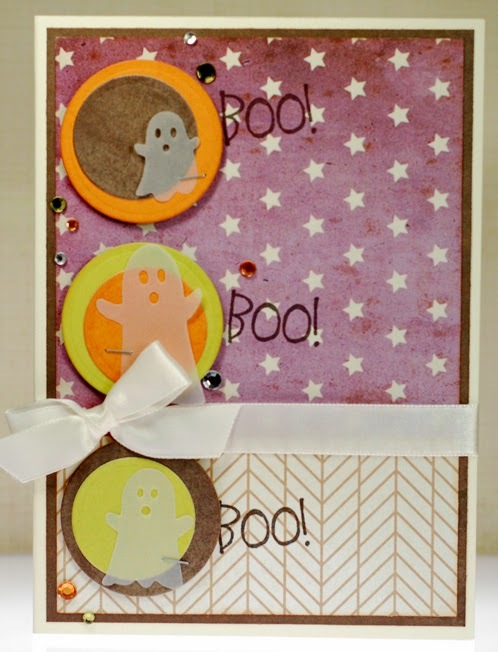 I love this little trio of die cut ghosts from Memory Box and just wanted to have fun featuring them front and center. Okey dokey then, I'm outta here. Enjoy the rest of your weekend! Santa's little helper announcing some winners! It's time to announce the winners of the Sweet November October release! With all of that story happening I kept the rest of the card design super simple. Just a few strips of paper, a small spattering of enamel dots, a sentiment and it was done. 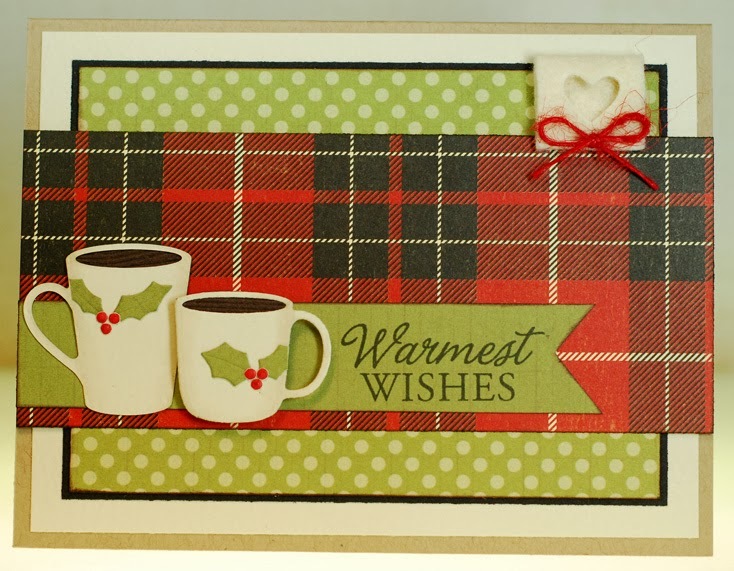 And while I'm still not ready to see any snow fall, I've gotta say that making these cards has seriously got me thinking about turning on some Christmas tunes. It's still early so I'll try to resist for a few more weeks, LOL! Alrighty, off to work I go. Hope your Friday is fantastic! We've got one more October preview to share before the stamps become available to purchase this morning in the CCD store. 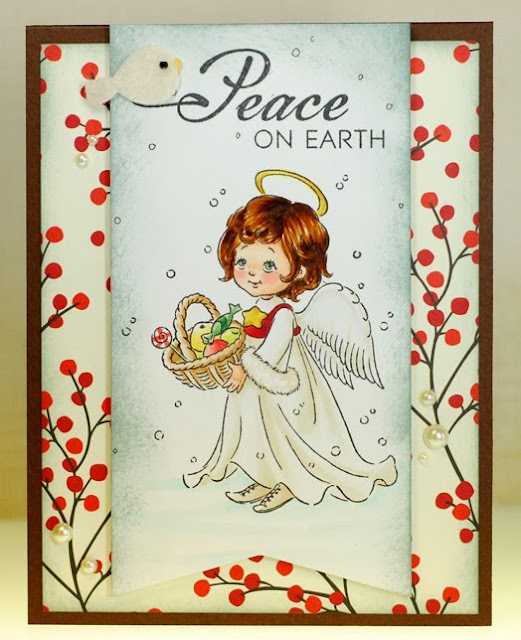 Drozy's Darlings has two adorable Christmas angels being added to the CC Designs family of stamps and I decided to ink up Praying Angel for my card today. 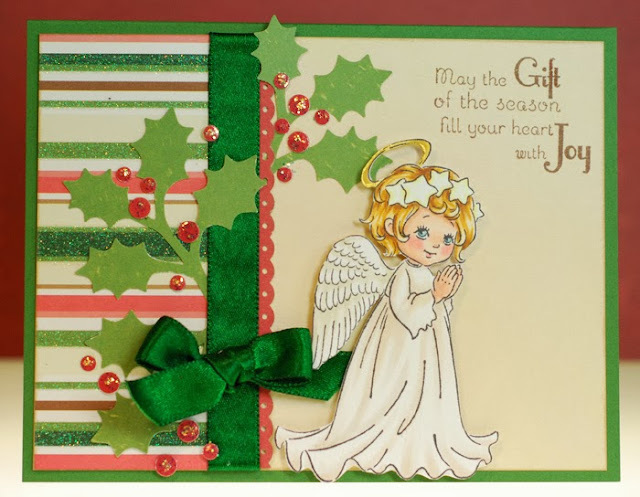 This heavenly little beauty was a joy to color and the whole card came together super fast. Comfort and joy and candy! 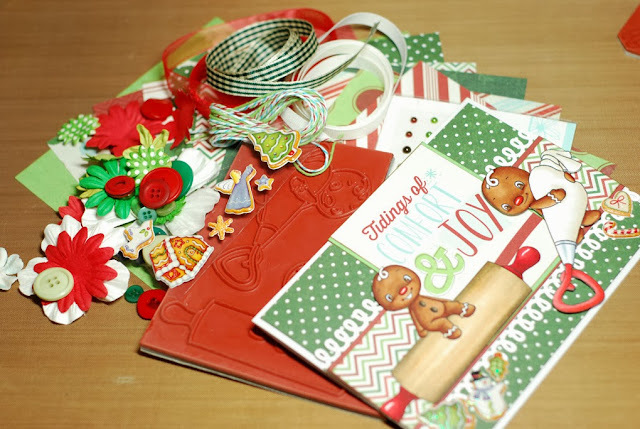 The third and final day of the October Sweet November previews is here and we are still enjoying the scents and sounds of Mrs. Claus' bustling Christmas kitchen. Gingy and his pals are busy at the cookie station... a place where they naturally feel right at home. One of the little gingerbread men is taking a break from rolling out dough, stopping to rest atop the well used rolling pin, while Gingy himself is practicing his skills with the icing bag. And the best part is that we get to enjoy the tasty delights that these magical Christmas gingerbread men have made just for us. 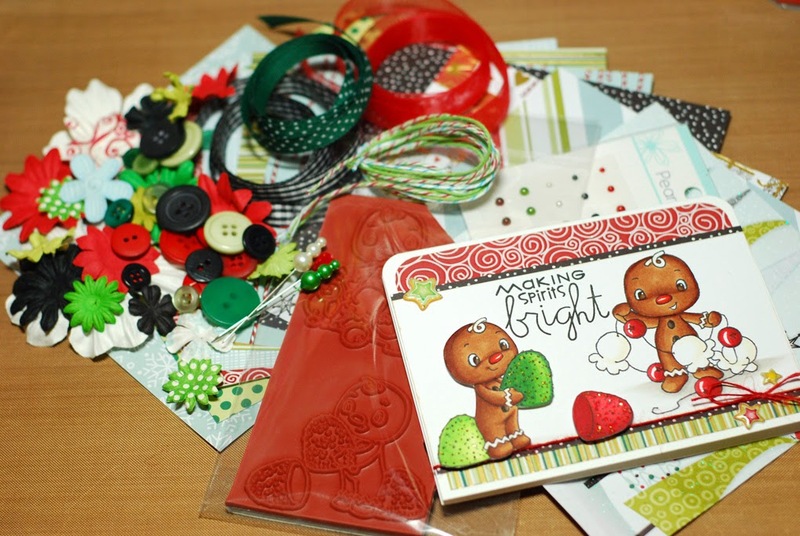 The Gingy candy kit includes; two Sweet November Gingy rubber stamps, ten 6x6 sheets of Simple Stories December Documented paper, Prima flowers, Kaiser Craft pearls, ribbon, twine, buttons, K&Co Christmas cookie pillow stickers, four envelopes, four card blanks and my card. That's a wrap on the Sweet November October sneak peeks. 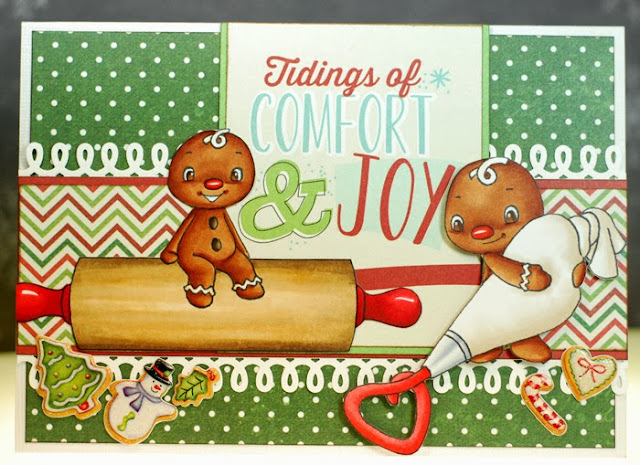 There are even more Gingy previews over on the CCD blog today with another chance to comment and win so don't miss that as well! 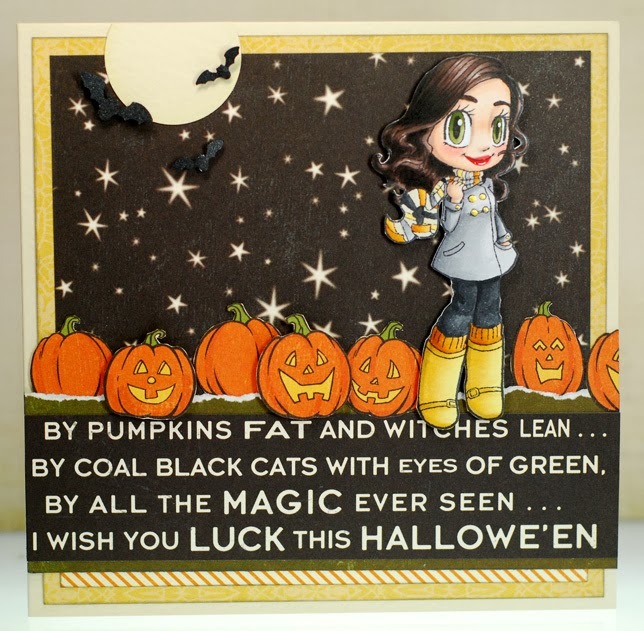 And all of the new October stamps will be available in the CCD store tomorrow morning, 10/3, at 9am est! Making spirits bright... with candy! Day two of the October Sweet November previews finds us back in the warm and inviting kitchen of Mrs. Claus. This cozy room is the abode of some very special gingerbread men. Christmas magic has brought these cute cookies to life and they love to spend their days decorating all sorts of holiday confections. Gingy and his pals have been busy popping popcorn... some to string for garland but most has been for munching. They have also been sorting the biggest and best of the gumdrops for the special gingerbread house that they've been putting together. The Gingy candy kit includes; two Sweet November Gingy rubber stamps, ten 6x6 sheets of SEI Kris Kringle paper, Prima flowers, Kaiser Craft pearls, ribbon, twine, buttons, stick pins, four envelopes, four card blanks and my card. Thanks for stopping by for the second day of Sweet November October previews. 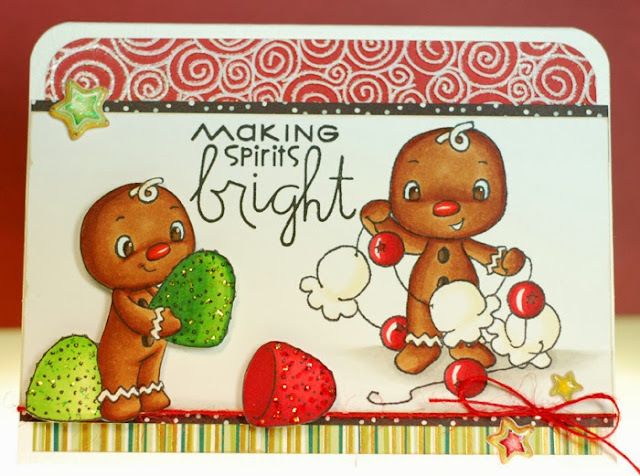 We have one more day of Gingy fun tomorrow, so I hope to see you then!